The government has not shown any interest in the possibility of shortening the Mid-Hill Highway by around 200 km, said a high level official at the Department of Roads. The detailed project report (DPR) of the project submitted to the government in January last year had urged it to adopt alternatives at some sections. Based on the report, the Department of Road (DoR) had also recommended that the government shorten the Mid-Hill Highway by around 150-200 km in some places. The cross-country road project has been conducting work on the 1,776 km highway as per the existing routes and the new road alignments approved by the government. Shortening the highway will bring savings in travelling time, fare and vehicle operating costs besides reducing the project cost, according to department officials. A senior official at the Ministry of Physical Planning and Works said that there were alternatives to reduce the road length in some sections, but changing the route would be difficult due to possible objections from local and central level political party leaders. “We will first complete the track opening work as assigned by the government, and this option can be studied later,” the official said. The DPR prepared by Tech Studio of Engineering (TSE) had showed that the Jorsal-Tamor-Sankrati and Sankrati-Myaglung sections of 102 km length could be replaced by the Jorsal-Myaglung section of 69 km length. There is a possibility of reducing 19 km by avoiding Hile while joining Myaglung with Bhojpur. Likewise, if Dailekh is avoided in the Chaurjahari-Dullu-Lainchaour section, 7 km can be saved. Alternative alignments of the Bhajankot-Bayalpate and Sanfe-Dipayal stretches on the Mangalsen-Silgadhi section will shorten the highway by about 5 km and 20- 25 km respectively. TSE had also suggested to the government to conduct a detailed study of these alignments before using them as new alignments. According to Umesh Jha, project manager of the Western Section of the Mid-Hill Highway Project, the idea of changing the alignment might not be accepted by locals after having seen construction work going on at their doorsteps. “We are concerned about the current alignments very much, and they can also be improved if needed in the future,” Jha said. At places, the existing routes have been included in the Mid-Hill Highway to save on building new alignments. This has made the total length of the highway go up and created problems. 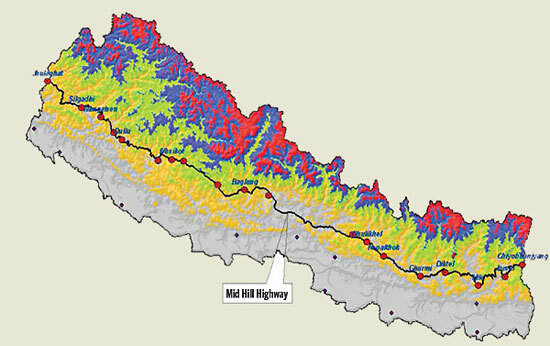 With the entire Prithvi Highway falling under the proposed Mid-High Highway, the DoR is now debating whether to remove the name of Prithvi Highway from the list of highways before officially designating the mid-hill road as a highway in the Nepal Gazette.